February 3, 2010 - WESTBURY, N.Y. – Staffing of fully trained and certified air traffic controllers at the FAA radar facility that handles the climb and approach phases of flight in the busy New York airspace, including all flights into and out of Kennedy, LaGuardia and Newark airports, has reached a critically low level after dropping 25 percent in the last six years. In 2004, the New York TRACON (Terminal Radar Approach Control) was authorized by the FAA to have 270 air traffic controllers but only had 211 fully trained and certified controllers on board, which represented an alarming shortage in its own right. But today, the total has dropped to 158 fully trained and certified controllers, of which more than two dozen are eligible for retirement today. The 158 figure represents the lowest staffing level at the facility since the PATCO strike of 1981. Within the next five years, more than 60 additional controllers will be able to retire. There is no relief in sight, as there have been only three new hires since 2006 that have successfully completed the training and certification process at a facility that is best suited only for experienced controllers to make it. “What we need from the FAA is a responsible, long-term plan to correct the staffing problem from the bottom up and controllers would like to be part of the process for discussing the issue and devising that plan with the FAA,” New York TRACON NATCA Facility Representative Dean Iacopelli said. “The key to properly staffing the New York TRACON is attracting and retaining experienced air traffic controllers. Not utilizing the promotion process that gives experienced controllers the opportunity to bid on jobs at the New York TRACON is counterproductive. The FAA’s plan to place inexperienced, newly-hired trainees here couldn’t be worse for the system from a safety standpoint and will adversely affect system efficiency as well.” NATCA joins all New York members of Congress in their concern about the facility’s low staffing level. The New York Terminal Radar Approach Control (TRACON), is located at 1515 Stewart Avenue in Westbury, New York. New York TRACON, which is also known as N90, is a consolidated TRACON meaning that all its radar facilities are in one location. The primary responsibility of the New York TRACON is the safe, orderly, and expeditious flow of arrival, departure, and en-route traffic. N90 is responsible for three major airports: John F. Kennedy International Airport, Newark Liberty International Airport, and LaGuardia Airport. Additionally, N90 is responsible for dozens of smaller but busy fields, including Long Island MacArthur Airport, Teterboro Airport, Tweed New Haven Regional Airport, and Republic Airport. N90 also controls the large number of VFR aircraft that fly through the New York Class Bravo Airspace everyday. 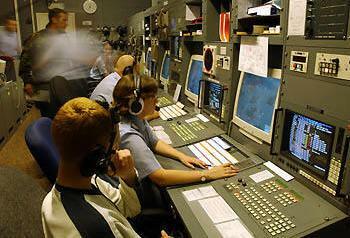 The New York TRACON is a Level 12 facility and one of seven "Large TRACONs" currently existing throughout the United States. The others include the Atlanta Large TRACON, the Boston TRACON, the Potomac TRACON, the Southern California TRACON, the Dallas Fort Worth TRACON (D10), and the Northern California TRACON.